Vietnam 3 Week Itinerary - All you need to know and see! Vietnam is one of the most beautiful countries in South East Asia and there is so much to discover and experience. From the hustle and bustle of its capital Hanoi, over the pretty Old Town of Hoi An, down to the dreamy fairy Stream of Mui Ne and the skyscrapers of Saigon, Vietnam has something to offer for everyone. We spent about two months exploring the best places in Vietnam and proudly present you the very best, assembled into one ultimate Vietnam 3 week itinerary. In this Vietnam travel itinerary, we’ll show you where to go (and how to get there), what to do and what to eat. To make the navigation easier we created a directory you can use to jump exactly to the parts that interest you the most. So sit back and enjoy this virtual trip through one of our favourite countries in the world. After a long flight, you’ve finally arrived at Noi Bai International Airport, about 26 km away from the Old Quarter of Hanoi. There are many different ways to get from the airport to Hanoi. We personally recommend taking a Grab. It’s the South East Asian version of Uber and the fastest and easiest way to get from point A to B in Hanoi and other Vietnamese cities. You can download it in the Google Play Store and on the Apple AppStore. We paid about VND 250’000 (about USD 11) for a ride from the airport to Hanoi. Most of the time you don’t need any transportation to get around the important places of Hanoi. We recommend Grab if you do need transport. It’s cheap, quick and you are least likely to be scammed. There are also taxis and cyclos (three-wheel bicycle taxis) available. If you decide to take a cyclo, make sure you agree on a fixed price before you start. A common scam is that the cyclo driver will give a price and then charge double once you’ve arrived, claiming the given price was for one person and not for two. If you decide to take a metered taxi, make sure they actually use the meter or agree on a fixed price beforehand. Check this page to find out more about taxi prices in Hanoi. The Old Quarter and the French Quarter are the best options for staying in Hanoi for a short time. In both of them, you are relatively close to the most important sights and some really good places to grab delicious food. The Old Quarter, located north of Hoan Kiem Lake, has the most reasonably-priced hotels, hostels, tourist shops and restaurants/cafes. It is more than 2’000 years old with narrow streets dominated by motorbikes and street vendors. It is perfect if you want to stay in the centre of the action but still have a budget to keep to. We stayed there in the Hanoi City Backpackers Hostel and were in the middle of all the action (and very close to a delicious Banh My street food stall). The French Quarter south of the Hoan Kiem Lake is less chaotic than the Old Quarter and there you can find some great upper-class hotels and restaurants. It’s perfect for people who are in search of more luxury but still don’t want to miss the action and central location. Explore the streets of the Old Quarter in Hanoi and lose yourself in the hustle and bustle of Vietnam’s oldest continuously developed area. Take a stroll around the Hoan Kiem lake and visit the Ngoc Son Temple, which is dedicated to General Tran Hung Dao who defeated the Mongols in the 13th century. Find the best food the Old Quarter of Hanoi has to offer or take part in a street food tour. Visit the Ho Chi Minh mausoleum and pay your respects to the preserved body of the most iconic and popular leader of Vietnam, Ho Chi Minh. Feel like a scholar and visit the Temple of Literature, which was originally built in 1070 as a university. Shop till you drop in the Don Xuang Market. Enjoy an entertaining Water Puppet Show in the Thang Long Water Puppet Theatre. Get your adrenalin kick at the Hanoi Train Street. Get fresh beer (Bia Hoi) at the Bia Hoi corner for less than 50 cents. Marvel at the St. Joseph’s Cathedral. Visit the Museum of Ethnology to learn more about the 54 officially recognised ethnic groups in Vietnam. Bun Cha – Grilled pork with noodles, our favourite food from Vietnam! Bia Hoi – Freshly brewed beer, light and refreshing, best savoured while sitting on small plastic chairs and watching the world go by. Read more about the delicious food in Hanoi in our ultimate guide to food in Hanoi Old Quarter. We continue the 3 week Vietnam itinerary with a trip to the jaw-dropping Halong Bay. The easiest way to get to Halong Bay is with a guided tour. They will pick you up early in the morning in Hanoi and drop you back on your last day of the tour. If you would rather get there without a guided tour, then you can check on 12go.asia for other ways to get from Hanoi to Halong Bay. You can then book a tour of Halong Bay when you arrive. However, we recommend booking a tour online in advance, as the chances of you getting ripped off on the spot are quite high. Well, this is answered very quickly: By boat. Swimming is not recommended as there can be a lot of jellyfish. Where you stay in Halong Bay really depends on how you’d like to experience this highlight of Vietnam. You have the options of staying on land in either Ha Long City or on Cat Ba Island or you can stay on board one of the boats. Some boats even offer one night on board and one night on Cat Ba Island. While it is cheaper to stay on land overnight, you lose out on the experience of sleeping on a boat, surrounded by the beauty of the limestone islets that make Halong Bay. It is really a very unique experience! Also, if you sleep on board a boat, you normally venture further into the bay and see more of its magnificent charm. A little tip for your choice of boat. While it might be attractive to go for the cheapest offer, it’s not necessarily the best option. First, you are probably doing this only once in your life, so you don’t want to skimp too much on the quality. Second, you never know why it is so cheap and you surely don’t want to sink with the boat without any life jackets! We had a great experience with the Carina Cruise. You can read more about a typical 3 days / 2 nights cruise in the post we’ve written about it. First and foremost, lean back and enjoy the ride. Honestly, there is a good reason why Halong Bay is one of the most attractive destinations in Vietnam. The UNESCO World Heritage Site has thousands of stunningly beautiful limestone islets, sometimes with tropical forests on them. As you’ll most probably be on a boat, your meals will be set. We totally recommend getting some seafood dishes if you have a choice. In Halong Bay, we had some of the most delicious and freshest seafood of our whole stay in Vietnam. The next stop on our 3 week Vietnam itinerary is the royal city of Hue. There are basically three different ways of getting from Hanoi to Hue. By plane: Probably the easiest and fastest way to get from Hanoi to Hue, but also the most expensive. By bus: This is the cheapest way to get from Hanoi to Hue. But it will take about 13-15 hours. You can go during the day or take a night bus. If you’re on a tight budget, then it’s probably the best choice for you. By train: In terms of price, taking the train lies somewhere between the bus and the plane. It takes more or less the same time to reach Hue as with the bus. The biggest advantage of a train compared to the bus is definitely the comfort. You can get four-bed compartments which give you a lot more space and privacy than in a bus. This is definitely our favourite mode of transport in Vietnam. And if you’re worried about the safety of your luggage, you can have a look at our post about the best anti-theft travel bags and accessories to keep your travel gear safe. Check out 12go.Asia if you want to book your perfect transportation! The best way to get around in Hue on your 3 weeks in Vietnam itinerary is by bicycle. Some accommodations and bike shops offer bikes for a daily rent of about VND 25’000 – 35’000. You can also walk most places, but you’ll need to calculate more time. Cyclos are everywhere as well, but as for Hanoi, always make sure you agree on a fixed price beforehand. Unfortunately Grab is not available in Hue at the time of writing, so you’ll have to take a taxi. Make sure the driver uses the meter. You should pay about VND 12’000 per km and a lot of taxis are rigged, so make sure you know roughly how far you need to go. You can use Google Maps for this before you enter a taxi. The best area to stay in Hue is the city centre. It’s relatively close to the Imperial City, which is the main attraction. During our visit to Hue we stayed in the Midtown Hotel Hue which had some of the most comfortable beds and best WiFi we had in Vietnam. One of the highlights was also the view from the outdoor pool, overlooking the Perfume River. If you’re on a tight budget, we recommend you look for a hostel in Hue. A lot of them are situated in the Phạm Ngũ Lão Street. The main attraction of Hue is the impressive Imperial City. It is one of Vietnam’s seven UNESCO World Heritage Sites and a must see when you are in Hue. The original Imperial City of Hue was a walled fortress and the capital of the Nguyen Dynasty between 1805 and 1945. Even though a lot of the magnificent place was destroyed through several wars, it is still absolutely stunning and definitely worth a visit. We recommend doing this through a tour because you can learn so much about Hue’s history this way. So what can you do after you’ve seen the highlight? Stroll along the mighty Perfume River and enjoy the vistas (get some good travel sandals for this activity). Banh Khoai – Pan-fried, crispy crepe, filled with shrimp and pork belly or sausage. Our favourite place of the 3 weeks in Vietnam itinerary is the picturesque town of Hoi An. The easiest and cheapest way to get from Hue to Hoi An is definitely by bus. You pay about VND 140’000 – 180’000 (USD 6-8) for the ticket. The bus ride will take about 4 hours. The more expensive, but definitely more attractive and adventurous way is to take a full-day Motorbike Tour from Hue to Hoi An. This way you will enjoy some amazing views on the route, like for example Elephant Springs, the Hai Van pass, and the Marble Mountain. 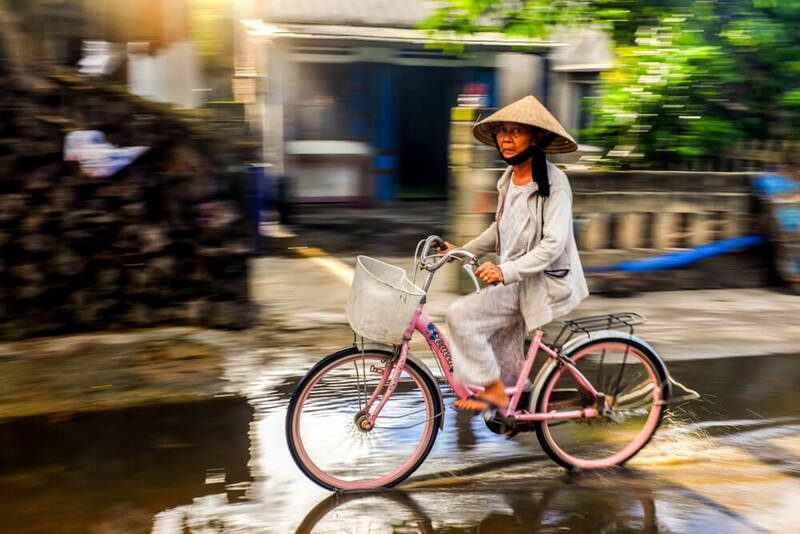 No matter whether you cruise through the narrow streets of the Old Town or through the scenic rice fields outside of the town, the bicycle is your best companion in Hoi An. If you don’t like to cycle, then you can also easily reach most places within the Ancient Town of Hoi An by foot. Grab is also available in Hoi An and perfect for any longer rides, like if you would like to visit Danang. Hoi An is relatively compact and you can get everywhere in the town within 30 minutes on foot. If you want the most intense experience you can try to get a hotel within the actual old town, but there is not a big choice. One of the better Hotels in this area is the Vinh Hung Heritage Hotel, very close to the famous Japanese Bridge. There is a lot more choice outside of the Old Town. The first time we visited Hoi An we stayed in the Hoi An Emerald Waters Hotel & Spa, which lies conveniently between the beach and the Old Town of Hoi An. The second time we chose the Hoi An Emotion Boutique Hotel, which lies east of the Old Town and has very spacious rooms, a great pool and fast WiFi. If you are more interested in the sea than the Old Town of Hoi An, then there are also some great beach resorts to be found very close to Hoi An. One of those places is, for example, the Beachside Boutique Resort Hoi An which looks really amazing! Hoi An sometimes gets flooded in the wet season, especially during November and December. The people there are used to this, but if you are visiting during the rainy season then we recommend you book a hotel further back from the river. This will save you from unexpected disasters on your Vietnam 3 Week Itinerary. There are many things to do in and around Hoi An. Most other travellers we met regretted not planning in some more time for this lovely town in their Vietnam backpacker itinerary. The ultimate highlight for us was the Hoi An Lantern Festival! It’s amazingly pretty to see all those colourful lanterns illuminating the traditional Old Town and the river of Hoi An. Read more about the Lantern Festival here. Banh My – Even though you can get them everywhere in Vietnam, the Banh Mi from Phi Banh Mi in Hoi An was the best we ever had! Next on this 3-week itinerary Vietnam is the coastal city of Nha Trang. There are three different modes of transportation to get from Hoi An to Nha Trang. By plane: The fastest way to get from Hoi An to Nha Trang, but also by far the most expensive. You have to take a Grab/Taxi first to get to the airport in Danang and fly to the Cam Ranh Airport in Nha Trang. By bus: The cheapest way to get from Hoi An to Nha Trang is by bus. It will take you about 12 hours. Calculate some more time in because Vietnamese buses are not very reliable. Buses go during the day or by night. By train: The train from Danang to Nha Trang has definitely the best value of all three transportation options. It takes about 10 hours to reach Nha Trang by train. At the time of writing, it is only possible to take the train during the day. Nha Trang is suitable to explore with a bicycle on your own. It is also quite nice to stroll along the beach on your own two feet. For further distances, we recommend ordering a Grab. In our experience, taxis and cyclos in Nha Trang most likely scam you, so we don’t recommend them. Most people who visit Nha Trang decide to stay in one of the hotels directly at the beach, like for example the InterContinental Nha Trang or the cheaper Hotel Novotel Nha Trang. For a smaller budget, we recommend the Alley Hostel, which offers private rooms, family rooms and also beds in a 4-bed mixed dormitory. If you would like to splash out, you could book a room in the Vinpearl Resort & Spa Nha Trang Bay on the Hon Tre island. The whole of Hon Tre island is basically one huge resort with a giant amusement park and beautiful beaches. Try one of the Craft Beers at Louisiane Brewhouse and Restaurant and Resort. P.S. They also have a pool and beach. Banh Can – Small rice flour pancakes topped with meat, seafood, and egg. The second last stop in the Vietnam backpacking itinerary is the fishing village of Mui Ne. The best, cheapest and quickest way to get from Nha Trang to Mui Ne is by bus. It’s also the only way. The bus should cost you less than VND 180’000 (USD 8) and the ride takes about 5-6 hours. On the way to Mui Ne, you can already see some of the famous sand dunes. Our main mode of transport in Mui Ne was a bicycle. It’s a really amazing feeling to cycle along the coast road! It’s also relatively easy to hire a motorbike in Mui Ne, but we often heard stories of very strict police controls around Mui Ne. Taxis are widely available and most of them are metered. However, we found that metres are often rigged. There are actually not a lot of accommodations in the fishing village of Mui Ne itself. Most of the hotels and guesthouses lie on the seemingly endless stretch of beach between Mui Ne and Phan Thiet. There is something for everyone amongst these various options. Our personal recommendation is the Suối Tre Guesthouse. It’s not only good value, but also the owners of this place are wonderful people. You can read more about why we loved this guesthouse so much on our post about things to do in Mui Ne. If you are looking for a more luxurious place, then the Bamboo Village Beach Resort & Spa with two swimming pools, a spa, and an on-site restaurant might be more up your alley. We spent about two weeks in Mui Ne and wrote a post about all the things to do in Mui Ne. Two weeks was too long for us, but depending on your interests, you can easily enjoy this place for a week. Just make sure that you have some good mosquito repellent with you when you spend your evenings at the beach! Not a dish per se, but an awesome place to eat is the Dong Vui Food Court, about 2km west of the Fairy Stream. There is such a huge variety of local and international food that you could eat something new every day for weeks! If you fancy some western food by now, then check out Mr Burger (50m east of the Fairy Stream). Getting towards the end of your Vietnam north to south itinerary, you eventually reach Ho Chi Minh City. The cheapest way to get from Mui Ne to Ho Chi Minh City is again by bus. The ride costs about VND 140-230k (USD 6-10) and takes around 5 hours. The quickest way to HCMC is to take a direct taxi from Mui Ne to Saigon (which will cost around USD 150-200). Somewhere in between is the option to take a taxi to the nearest train station Phan Thiet. From there you can then take the train to HCMC for about VND 250-275k (USD 11-12). The train ride itself takes approximately 4 hours. The traffic in Ho Chi Minh City can be overwhelmingly chaotic. Driving your own motorcycle on these streets is highly discouraged if you value your own life. There are however some other good transportation choices. Like elsewhere in Vietnam, Grab is a top choice. If you feel daring, you can even get a Grab Bike. It’s cheaper than a Grab Car and you can experience the busy streets while being in the thick of it. Taxi scams are commonplace in HCMC, so make sure that if you use a taxi, you try to get one of the more reputable companies like Mai Linh Taxi or Vinasun. Ho Chi Minh City is divided into 24 districts. Each of them offers different accommodations and experiences. We will show you the most important ones. The probably most popular district in HCMC is District 1, the Downtown. Ii is HCMC’s commercial and financial hub and sports a lot of popular attractions like the Jade Emperor Pagoda, the Notre Dame Cathedral or the Reunification Palace. Because it is such a prominent area, the range of accommodation goes from budget guesthouses like the E Hostel to super luxurious hotels like 5-star hotel The Myst Dong Khoi with a rooftop pool. District 5, Chinatown, is great for people with a tight budget, as you can find some really cheap and attractive accommodations there, like for example the Sakura Hostel Cholon which offers private rooms and beds in mixed or female-only dormitory rooms. In Chinatown, you can also find the Binh Tay Market, which is the largest market in Vietnam. If you don’t want to be in the hectic centre of Saigon, then you could think about getting your accommodation in the District 3. This area is about a 20-minute car ride away from Downtown and many expats live in this part of Ho Chi Minh City. Around here you can also find many international restaurants. A big bonus of this area is, that you can find some great apartments for rent here, like for example the Lucyhome Masteri Thao Dien apartment. Enjoy a spectacular 360-degree view from the Bitexo Financial Tower, 178 meters above ground. On this day your Vietnam 3 Week Itinerary comes to an end. Eat a last delicious Banh Mi or have Pho for breakfast and then pack your things, slip in your compression socks and head to the airport. If you had a similarly awesome time in Vietnam to us, then we are sure that you will be back sooner or later. Be it for the fresh and delicious food, the lovely people, the beautiful landscapes or just the great spirit of this country who conquered our hearts. Yes, there are scams in Vietnam, and yes, we fell for more than one. Most of them don’t hurt your wallet too much, but it’s still always an annoyance. If you want to find out more about the scams in Vietnam, then you can click this link. If you wonder what to pack for your Vietnam itinerary, then have a look at this great packing list for Vietnam. We also recommend getting some packing cubes when you travel 3 weeks in Vietnam. It will make organising your stuff so much easier! To get around in Vietnam and in South East Asia in general, we often used 12go Asia. It is super easy to use and shows you a lot of different options. They are a very reliable company. You can use the finder underneath this text to find your perfect transportation. To find the best hotels in Vietnam, we recommend you use booking.com. We found some great deals during our stay in this amazing country. If you’re interested to find out what else Asia has to offer, then have a look at our other Asia posts! Hey Thomas, what a great article. You are capturing Vietnam in a fantastic way and I love the compact travel itinerary you have created. Easy to share with friends and family. I have an awesome tip for Saigon: In the Financial District, there is a bar called Snuffbox – one of the best Jazz Bars I have ever been to. thank you very much for your nice comment 🙂 We loved to spend some time at the Hub Hoi An and will definitely come back if our ways will lead us to Hoi An again <3 I'll have a look at this bar, but it sounds awesome!